A member of David Bowie’s inner circle made an unannounced visit to the Museum of Contemporary Art Friday to see “David Bowie Is,” the exhibit focused on his friend and colleague and gave The Chicago Ambassador an exclusive interview about his thoughts about it. Gerry Leonard, who was Bowie’s music director and guitar player on the “Reality” world tour in 2003 and 2004, was in town to play with Suzanne Vega at Space in Evanston and took advantage of a few free hours to visit the exhibit. After going through the exhibit, he chatted with The Chicago Ambasador at the cafe inside the MCA. Along with being Bowie’s music director and guitarist on the “Reality” tour, Leonard played on his “Heathen,” “Reality,” and “The New Day” albums and shares two song writing credits with Bowie, for songs “Boss of Me” and “I’ll Take You There,” which are on “The Next Day” Album. CA) You began working with David Bowie in 2003? LEONARD) Actually it was before that, the “Heathen” record. Umm, it was actually the “Toy” album (2001) which was the first thing that I played on. A friend of mine, Mark Plati, was the producer at the time and we were at the Looking Glass Studios in New York and I was in the little room making an independent record. Mark came in, and he knew my style of playing. He came in and asked if I could play on a Bowie song. I said of course, and later when I gave Mark back the track I said ‘can I meet him?’ So he came in later on and of course was really charming. Then I played on a few more songs, including “Shadow Man” which I’m excited will come out on the new compilation. So we worked on the “Toy” record, and then that project kind of went away — he put it on the shelf. And then, David went off to make the “Heathen” record and called me at the end of that process and asked if I could come in and do some overdubs, so I did. And then, he decided to do the “Heathen” album and the “Low” album live for the Meltdown Festival in London he was curating that year and they needed a guitar player do do all the out-of-the box stuff, like the (Brian) Eno and weird stuff on “Low.” and the David Torn stuff on “Heathen.” So, that’s kind of how I fell into the David camp. CA) You were basically a fan before playing with him? LEONARD) Of course. I was a fan, and just working on the New York scene and he came and saw me play. I have a solo thing called “Spooky Ghost” and he said to Mark, ‘Can Gerry rock?’ –that was his question. Mark told me that afterwards. I was playing at The Living Room in New York, 50 people (capacity), I had my trio, we used to project Betty Boop cartoons and do my own music. I knew he was coming, Mark tipped me off that he was coming and of course I was terribly nervous. He came and he was great, he heckled me and we had a good time and then he asked me to join the band. CA) What were your impressions of the exhibit? LEONARD) I thought it was really fantastic. I didn’t know what to expect going in but I found myself immediately really absorbed and fascinated. And halfway through the exhibit I was having this feeling of ‘wow, there is really something living about this.’ Despite the fact that I know David, I’ve spoken to him on the phone, been on the tour bus with him, been on stage with him, it’s still a thrill to see it all come to life. There’s so much art in what he did to this point and what he continues to do. His mind is fascinating the way he takes literature, visual art and music and somehow combines it in a thing, that he really puts on as a suit and it just works. It’s not some kind of amateur production. It’s high art. He manages to really do that with his albums and tours and videos in such a powerful way, it’s like living art. That was the thing that really stood out. CA) Were there things that you were surprised to learn about David from the exhibit? LEONARD) Yeah. It was really fascinating to see how these things gestated from scribbles on a page into the iconic things that we all know and grew up with. When we saw “Ashes to Ashes” or when we saw “Space Oddity,” the music, the visuals, the fashion, we just said ‘yeah, why not? We accepted it as if it was always there, this is great, this is pop music, this is rock and roll.’ But to see how he created it, from nothing. and combined all these elements, that was what was really fascinating to me. I had a moment where I was looking at the violin score for “Space Oddity” and it’s playing in the headphones — I’m following the score and seeing the arrangements. It was beautiful, it was a great moment. Because having done a lot of production and playing over the years, I know what it’s like to see the score come to life but this was a unique gift, to be able to see that, and to see his handwritten lyrics. 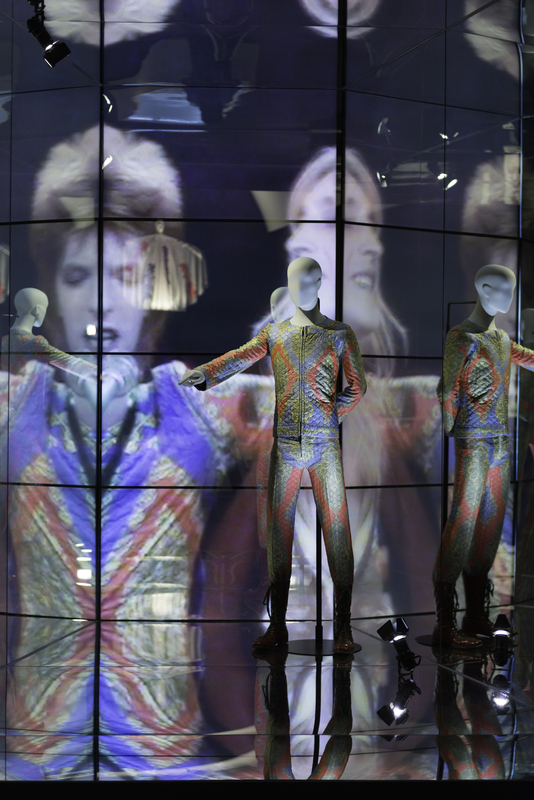 David Bowie’s “Starman” suit is displayed behind a video backdrop of Bowie performing the song. Photo by Nathan Keay. CA) Does his process remind you of anything you do, or is it completely different? CA) So he’s pretty regular and down to earth? LEONARD) Well, I wouldn’t say regular and down to earth. But as an artist, he’s got great editing skills and great ideas and a great process. He’s very, very creative and he’s very spontaneous and those are the things that make art. No matter who you are, you have to have concepts, you have to have an idea, you have to have a way of working, you have to have materials and the goods to do it and then know yourself, know who you are and what you’re aiming for. Of course, David has all these qualities and is incredibly focused. CA) Did the museum know you were coming? LEONARD) No. I really didn’t want to play that card. I just wanted to come and see it. LEONARD) It was really fun to sit back and see people enjoy it. I saw these two ladies and one poked the other one and started dancing. …What’s nice about the exhibition also is that you have these headphones and everybody is kind of in their own little world, having their own Bowie experience. It’s nice because even though you’re aware of other people, you still have your own personal experience. CA) Will you urge David to come and see it before it’s over? 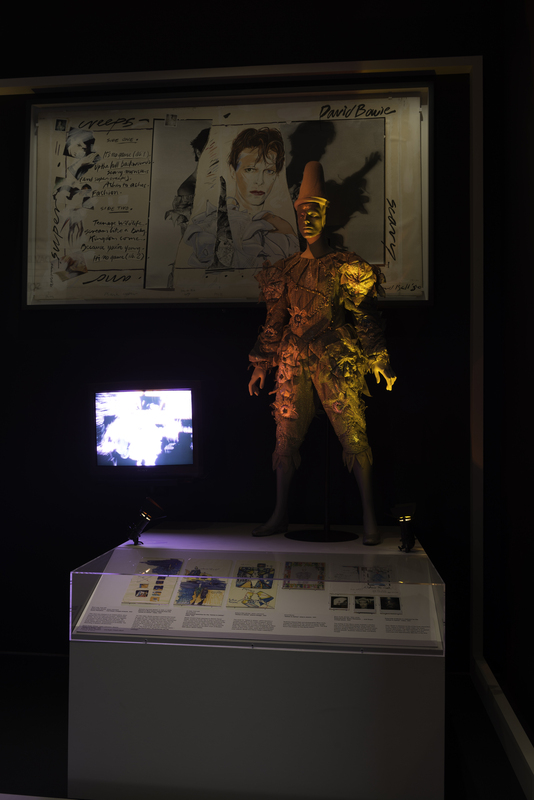 Bowie’s outfit from his “Ashes to Ashes” video. Photo by Nathan Keay. CA) You’re from Dublin but you’ve been in New York quite awhile now, correct? CA) What are your thoughts about Chicago? LEONARD) I love Chicago. I’ve come here to play many times and have worked with Steve Albini at his studio here. I find there’s a sense of American history here that I really enjoy. There’s a feeling of the growth of America. It has it’s own style, it just feels like a real city. It has a footprint. It’s not trying to be anything else and I enjoy that. CA) Are you still working with David? LEONARD) I would say, yes. It was a great pleasure to get called for “The Next Day” record sessions and he called me. I was part of the first group doing the demos and I feel like that’s a record I really have a footprint on. I was on most of the tracks and I feel like my identity is there where often I’ve played on David’s tracks and I’m one of the elements. He just did this beautiful track with Maria Schneider (a jazz song called “Sue (Or In A Season Of Crime)”) and that’s what he wanted to do and he’s free to to that. Personally, I never play jazz on purpose. I only play it by accident. CA) Are you not a fan of that collaboration? LEONARD) I am, I love it! I wrote him and I congratulated him and he wrote me back a very nice email and he said ‘it was a beautiful experience and it was like working with you’ which is a huge compliment and very kind. CA) Do you know when you’ll work with him again? LEONARD) We talk when there’s something to talk about or if there’s something that comes up that he enjoys. Like, he’ll send me a link to a Spike Milligan thing that he comes across because he knows we both like Spike Milligan, and get a laugh out of it. I don’t bother him with day to day things. So, I’m happy to have worked with him and hope to work with him again. I noticed in the exhibition, which is heartening to me, that he does come back to the same people. I noticed a lot of video directors that worked on the videos for “The Next Day” were ones that he worked with in the past. A lot of the costume designers he worked with previously he comes back to also. So, I hope he does the same with his band!